We have always been going to Batangas a few times a year. It was this summer that we are able to find out great things which are more than the usual. 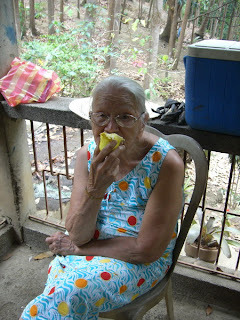 My grandmother decided to celebrate her 91st birthday there, up the mountains, far from the noise of Quezon City. This was the one weekend everybody's been excited about. It was a time to escape everything from the city even for a short while. 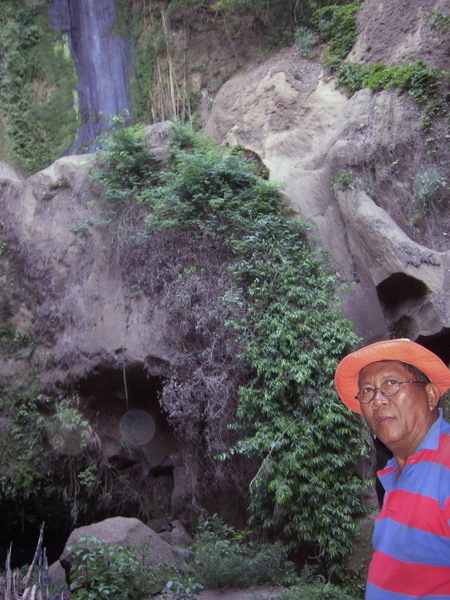 My father Numeriano, was born there in Laurel, Batangas. He always loves nature same as my mother. When they retired from work, they decided to live in a native house up the mountains with water and electricity. He planted a thousand trees in that barren path of land which is now completely covered with tall and proud Mahogany Trees. We grew up loving nature and loving pets. For us the simple life is OK. That's what we cherish at times when we get there. The serine surrounding while looking up to the sky with leaves covering part of the view. But this time there are a few fascinating things that makes us love the place even more. That Saturday morning, they went ahead to Batangas and I left hours after them. I was still finishing up some work at home. I commuted going there. The trip was a bit stressful, because of the traffic along Calamba. It's high noon when I arrived. After alighting from the jeepney, I strutted my way up the dirt road alone. Even if it was truly hot, I loved the stroll facing the mountain, my landmark. 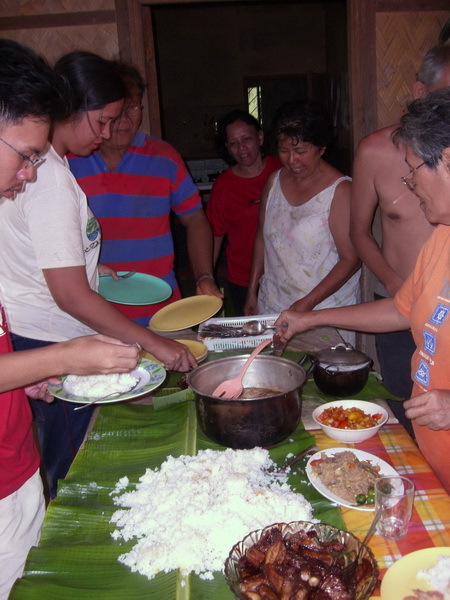 I reached our place after 15 minutes, and then I saw my family, my aunts and uncles, who were already lounging at the open hut beside my mother orchid garden. They were enjoying the mountain breeze and the view of Taal Lake and the volcanoes. My parent's dogs greeted me on my way to there. That night we decided to have a picnic at the lake. We planned for night swimming and moon watching. But when we arrived at the lake, the wind was strong, so the water wasn't calm, so we decided to return the next day for swimming. Early that morning, we headed to Taal Lake, brought our breakfast of pancit and bread with us. After eating, we went swimming. Before there were "tulya", a small variety os fresh water shellfish, now there's a new kind, like a cross between "tulya" and mussels. It was truly big. We enjoyed gathering them. It was almost a competition who got the biggest. It's cool; you get to feel with your toes, if you're stepping on one, then you dive for it. They are embedded in the sand. We returned back at the house for lunch. My mother and aunts cooked while my uncles went up the hill to pick some cashew fruits. Cashew fruits are juicy and sweet when ripe, but they're known to stain your clothes. Lunch was great, we ad some barbecue pork, sinigang na hipon(shrimps cooked in tamarind soup)and fried Tilapia. They were all laid out on banana leaves for that native feel. Tilapia is the main agricultural produce of Laurel. 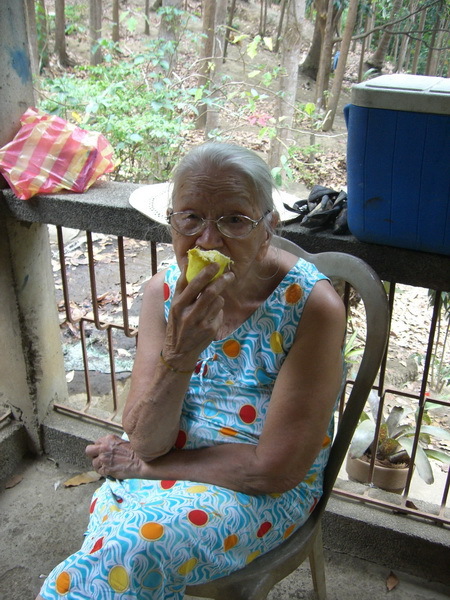 During our summers here, we commonly enjoyed fresh coconuts, ripe papayas, Indian mangoes, jack fruits and cashew fruits. After resting a bit, lounging under trees, and sleeping on hammocks, we asked our father to take us to Ambon-ambon waterfalls that is near Las Haciendas. It's a bit far. 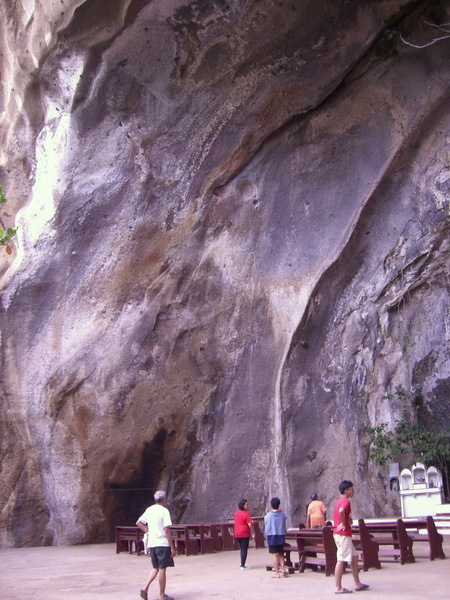 We went to Las Haciendas and saw the sign towards the Simbahang Bato(Rock Church). We drove alongside rice paddies and across clear streams. It was situated deeper in the town of Laurel. 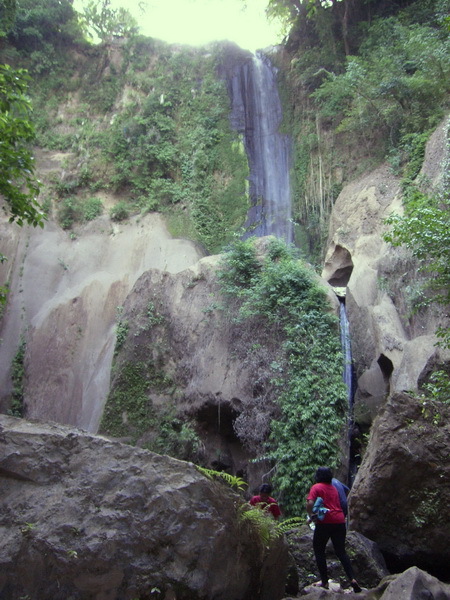 When we arrived, we were struck by the magnificent view of the Simbahang Bato. It was almost a cave curved out of a big solid face of the mountain. As if it was scooped out of the mountain. It was naturally sculpted. It's nice and solemn, and it is grand. The birds chirping gave it a pleasurable background tune. Crevices are homes for the native Martinez birds and there were bats present too. Birds were flying all around. 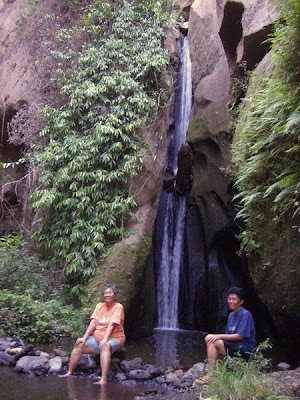 Our next stop is the Ambon-Ambon waterfalls, which we saw at Extra Challenge and learned that it is in Laurel all along. So we had to see it. We drove uphill to Las Haciendas only to learn that we took the wrong way. We asked several folks and learned that the access is right at the back of my parents’ cooperative's office. We were really excited. The folks said we had to cross 3 streams to get there. The hike was easy. We crossed a bamboo bridge on the first stream, and crossed the second one where kids swim at the far portion. And crossed the third one, where we lost our direction after. Good enough that there are some people there who told us how to reach the place. There was also the part where we headed straight and got lost, and the good men cutting down bamboos directed us to the path uphill, which was a bit slippery due to the dry loose powdery soil. Thank God I still have strong knees. Then we saw the path leading to the stream and we followed the stream. I love it when we're near the falls, we can hear the rushing of the water. We hopped over boulders and entered a dark cove with walls covered with ferns and other plants. It reminded me of fairies. 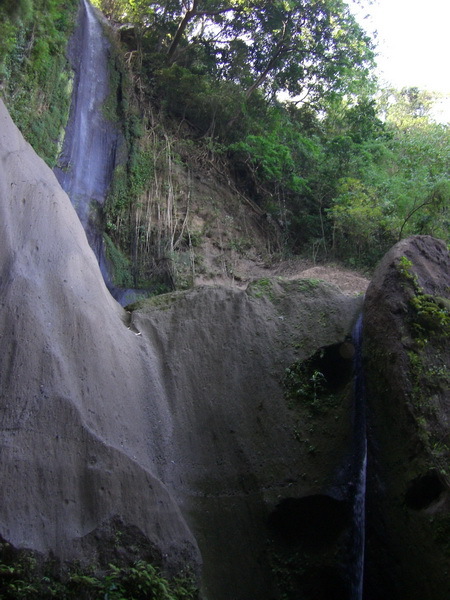 From afar, we saw the waterfalls having different levels. It was summer so the volume of water wasn't that much, hence the name Ambon-Ambon meaning rain showers. It has big curved solid rock walls, some people rappel here. It was a beautiful feeling that we've finally found it. That summer we discovered new things in our usual hideout, first the big shellfish from the lake, second is the Simbahang Bato and last but not the least is the Ambon-Ambon waterfalls. I guess there are still some things we don't know about the places we usually go to. Imagine finding something great at your own backyard.